Der Februar 2015 Newsletter des Nachwuchsforums der GKS ist erschienen. Bildergalerie der Aktivitäten des Nachwuchsforums auf der 36. Jahrestagung der Gesellschaft für Kanada-Studien. "Mehrheiten und Minderheiten in Kanada und Quebec"
We are happy to confirm our second keynote speaker for the 12th Graduate Student Conference in Canadian Studies. Prof. Dr. Konrad Groß of the University of Kiel will open the conference on July 3, 2015, at the Embassy of Canada in Berlin. Prof. Groß's talk will discuss the evolution of Canadian studies in the German-speaking countries and Europe and contextualize current trends and developments in the field. Prof. Groß received his PhD from the University of Cologne in 1970 and thereafter developed a comprehensive research agenda with a focus on the literature and culture of Canada. Among his many publications, his most recent is a collaboration with Prof. Dr. Jutta Zimmermann for an edited volume of key Canadian literary and historical texts entitled Postcolonial Literatures in English (Wissenschaftlicher Verlag Trier, 2012) and an article on "Trickster Revisited: The Not So Unhumorous Indian" (Literaturwissenschaftliches Jahrbuch der Görresgesellschaft, 2013). Other titles include research in the narratives of exploration and discovery, regionalism, multiculturalism, and postcolonial studies. Between 1984 and 1987 Prof. Groß served as president of the Association for Canadian Studies in German-speaking Countries (GKS). 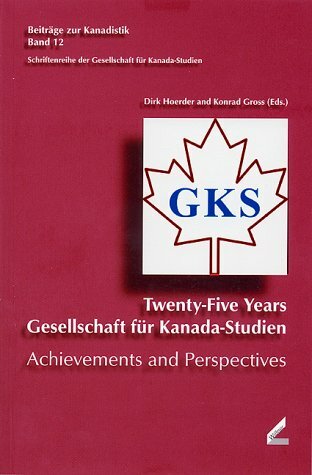 Prof. Groß's co-editorship of a volume on the occasion of the 25th anniversary of the GKS in 2004, moreover, presents a great vantage point from which he will share his insights about the academic history of Canadian studies in the German-speaking countries and beyond. For more information visit: http://www.anglistik.uni-kiel.de/de/fachgebiete/literatur-und-kulturwissenschaft/amerikanistik/mitarbeiterinnen/prof.-dr.-konrad-gross-pens.